8 August 2016. Vantage Kia, Bradford. Darren Binge, front, with members of his team, from the left, John Leigh, Michael Rider and Joe Ellis. 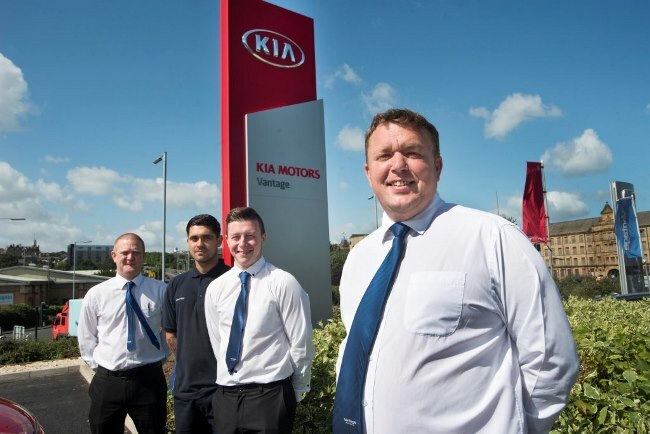 Knaresborough-based Vantage Motor Group, the fast-growing motor retailer with 26 dealerships across the North and Midlands, has invested £900,000 in building a brand new Kia showroom in Bradford. The state-of-the-art showroom, which opens this month, is Vantage’s second Kia dealership. It incorporates Kia’s new ‘Red Cube’ design identity, which features strong red cladding and distinctive side-return architecture. The site has an impressive eight-car showroom and 50 display spaces to showcase its offering of Kia models. Managing director Mark Robinson said: “We are excited about the opening of Vantage Kia Bradford, which is our second dealership to open in the city and which further underlines our ambition of being recognised as a Yorkshire-based national force in the motor industry. The Vantage Kia site will create up to 10 new jobs and is expected to sell 750 new and used cars per annum. It is Vantage’s fifth West Yorkshire dealership to open in 18 months as the company looks to increase its market penetration in the area. The acquisition reflects a period of phenomenal growth for Vantage Motor Group, which has seen turnover to the end of 2015 increase to over £200 million from £174 million in the previous year. Vantage Motor Group was founded in Harrogate, North Yorkshire in 2003. The Group now has 26 dealerships across Northern England and the West Midlands representing Mazda, Toyota, Kia, Citroen, Honda, Hyundai, ŠKODA and Lexus.